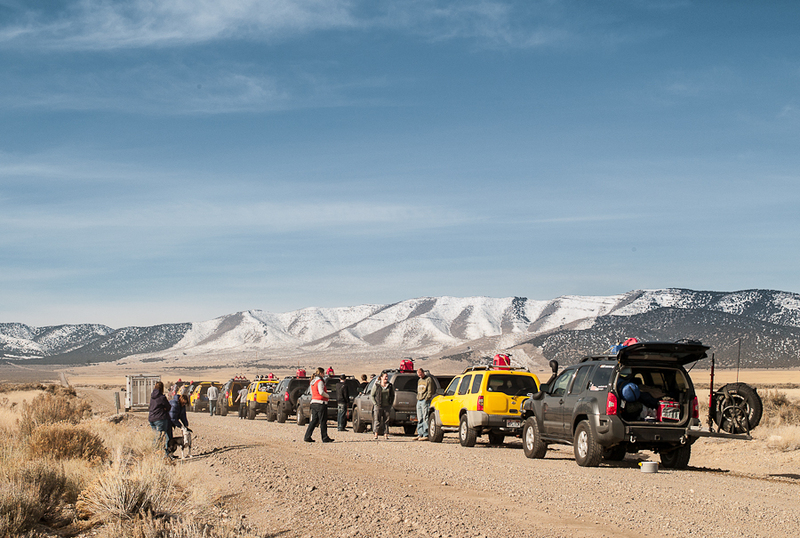 This past February 18th I joined up with the Utah Xterra Owners Club for their annual Pony Express run. Since moving to Utah this past summer and acquiring a 2006 Nissan Xterra I have been keen to get out and explore many of the canyons around Cache Valley. This past summer and fall the Utah Road and Recreation Atlas (Benchmark Maps) has been top on my reading list for finding new places to explore. 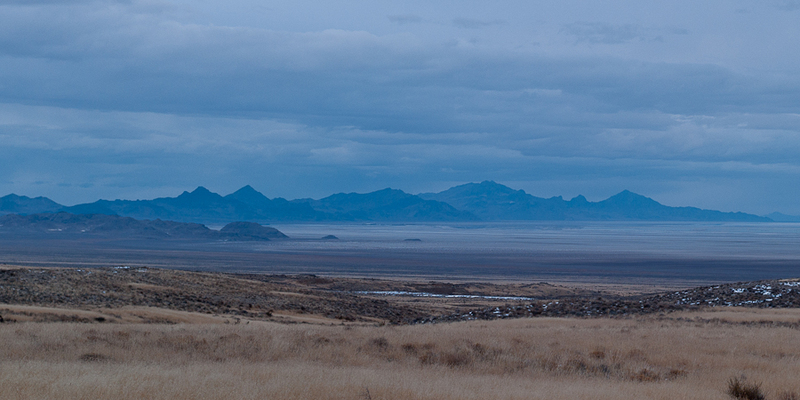 One place I have been really interested in is the west desert area of Tooele, Juab and Millard counties. 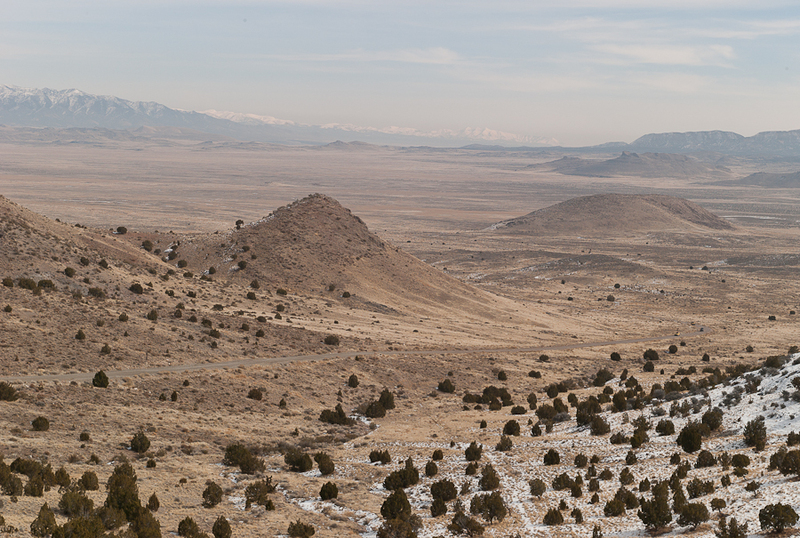 The area is also called the Great Salt Lake Desert and includes the Dugway Proving Grounds (no public access), The Pony Express Trail and a portion of the Historic Lincoln Highway. Plus it’s a really big wide open place with small mountains that look like islands and has tons of potential for photography. If that wasn’t enough my long standing project about looking at the west has up to this point primarily consisted of images showing how we experience the west through visiting National Parks. 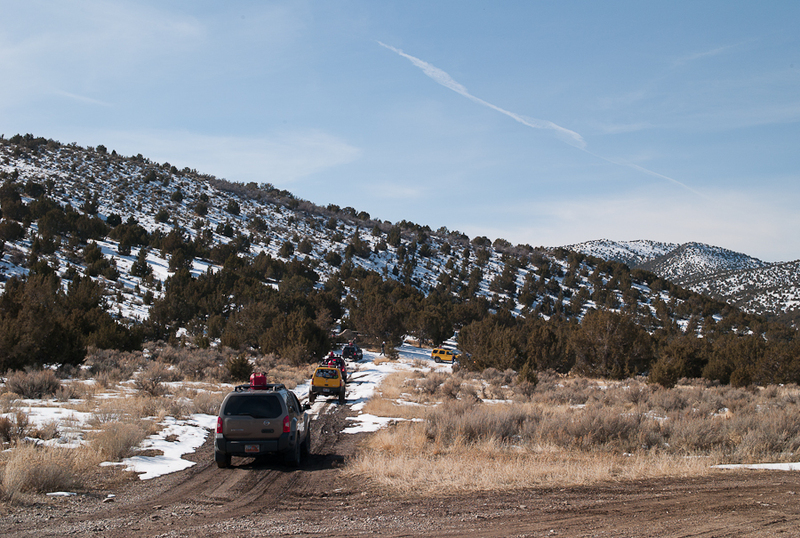 Joining up with an automobile club would be both fun and new way to think about how we experience the western landscape and meet some fellow Xterra owners. We planned to meet at 9 AM in at a gas station in Lehi. This was my first time here and I have to say I was impressed with the town’s old commercial district and the grain silo. It was a perfect sunny morning with lots of activity going on. 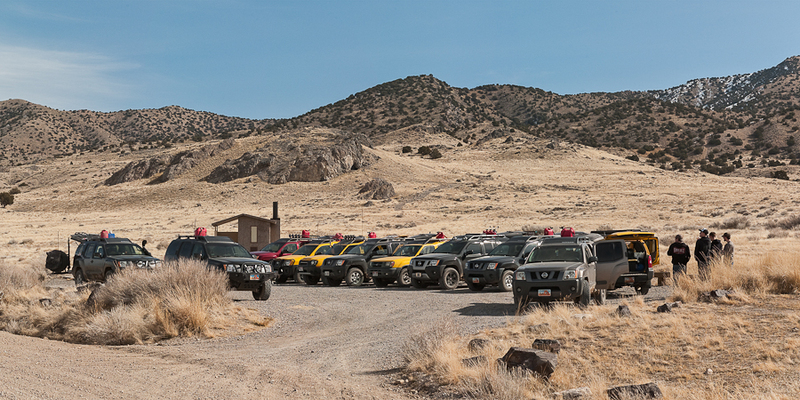 When the group of Xterra’s I was in pulled up to the gas station there were about 20 Land Rovers leaving on some adventure. Then I saw a group of road cyclists (about 30 strong) heading up the road. This must be a popular place. After everyone in our group of 11 vehicles had fueled up and did whatever we needed to do at the gas station we headed out taking 73 west toward Cedar Fort for about 30 miles then hit gravel road at Five Mile Pass and kept going west. After a short distance we stopped as a group to take the opportunity to air down our tires. This was something I was initially wary of doing since I did not have a way to air them back up. Talking to a few drivers I learned that by deflating the tires it would provide better grip and also absorb some of the road vibrations. With over 100 miles to go I decided to air down slightly and see if I noticed any difference. It was hard to tell how much difference it was making for my ride as I only aired down about 7 pounds. I’ll have to experiment with this more on future runs. Our next stop was Lookout Pass Station. We climbed a small hill had a look around, snapped some pictures of our vehicles with their first mud of the day then headed down to the walled off pet cemetery at the base of the hill. We attempted to drive up Little Valley Rd. on our way to Simpson Springs but due to bad road conditions we decided to head back to the main Pony Express Road. Being new to 4-wheeling it was one of the muddiest sections of road I have been on. I think it was a good decision to turn back and try it again when it has dried out. Soon after we arrived at Simpson Springs Pony Express Station and stopped for lunch, conversation and picture taking. The highlight of the stop was watching a helicopter rounding up what I assumed to be wild horses. After some time the horses actually ran pretty close to where we were parked and everyone tried their hand at photographing the action. I got a couple of shots off before my camera battery mysteriously died. After some time we geared up and headed west toward Dugway Pass. Between Simpson Springs and Dugway Pass it’s about 20 miles of straight and flat road. Leave plenty of distance between vehicles (dust and visibility) and watch your speed. It’s easy to start going fast and you have to remind yourself that gravel roads handle very differently from highways. A hole in the road or dip could put you in a bad situation a long way from help. After a restroom break at Fish Springs National Wildlife Refuge we stopped at Wilson Hot Spring. This was where my Xterra got muddy. The drive out to the spring was a sticky mix of mud, sand and salt. At one point I was sliding toward a very wet patch that had boards across it; some kind of sign not to go that way. Luckily I stopped before sliding into it and was able to back out and take the little bypass. The sticky mud reminded me of a passage in Earl Swift’s book The Big Roads, “a truck convoy finding the Siberling Cutoff impassable, set off across the salt. This would have been a risky move in a light runabout. In a giant cargo hauler the results were inevitable. every truck that ventured onto the flats broke through and became hopelessly mired; even a Caterpillar tractor failed to achieve any traction in the stinking goop that lurked beneath the surface.” (page 68). The story ends with the trucks being carried out by hand. I’m glad to be living in a time of better roads and capable vehicles. 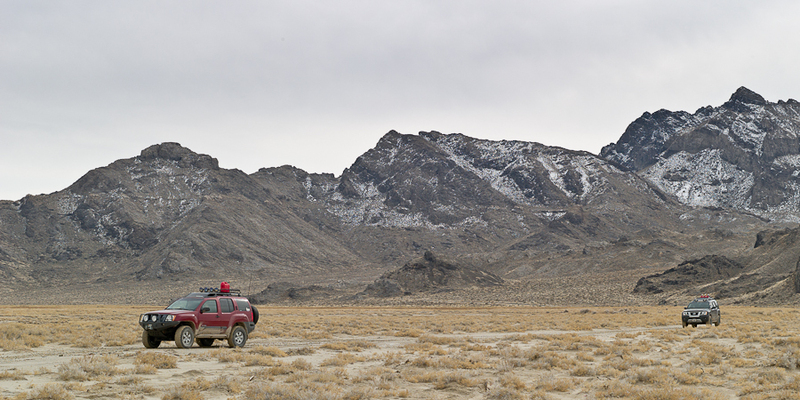 The story is a good reminder of the dangers of traveling in the west desert of Utah. A little farther down the road on the other side of the Fish Springs Range we took a side road at the Utah and Emma Mines. It was a nice climb up to the top. I waited on the main road until the end of our convoy as I wanted to get a shot of all the Xterras going up the road before I joined the party. 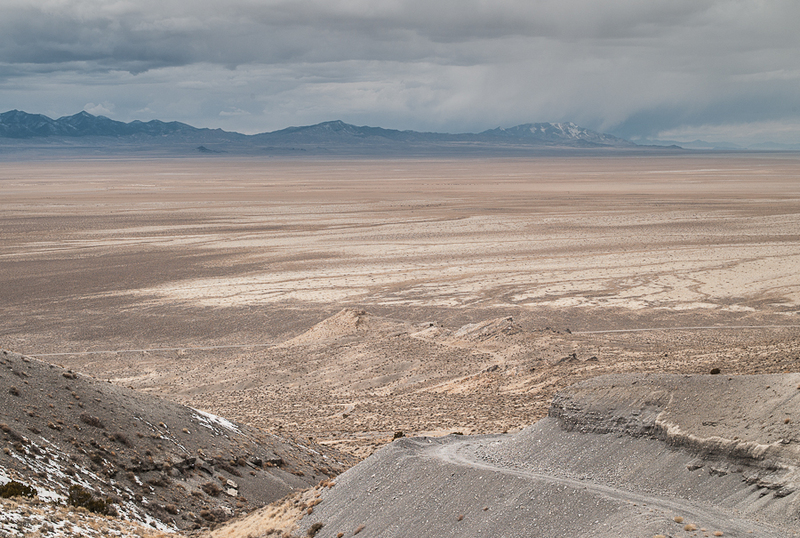 The drive up the old mining road ended with everyone parking in a row with a spectacular view of the Deep Creek Range and Snake Valley. In low range and third gear I only had to tap the brakes on a few sharp bends in the road on our way back down. At this point we would be heading in generally North West and would go through the very small town of Callao. About 5 miles out of Callao we turned onto a section of road that is marked both as the Pony Express Rd. and the Old Lincoln Highway. Except for one spot the road was dry but it was slow going as the road wound through many washes and small hills. This was the only part of the trip where we had traffic coming from the other direction. I can only imagine what it must have been like traveling in this area with a 1930’s or 40’s era vehicle (loose steering, breaks that lock up, no seat belts) and then coming around a curve to find another car headed your way. After 25 miles we were back on asphalt. Realizing we had missed the turnoff to take us to Gold Hill; members of our group talked via radio to see who wanted to go to Gold Hill and who wanted to just head to Wendover. Most of us decided to go to Gold Hill and arrived around 5 PM the place was literally a ghost town. I now understood why there were so many photos on the web of this old store front. It’s about the only thing there. 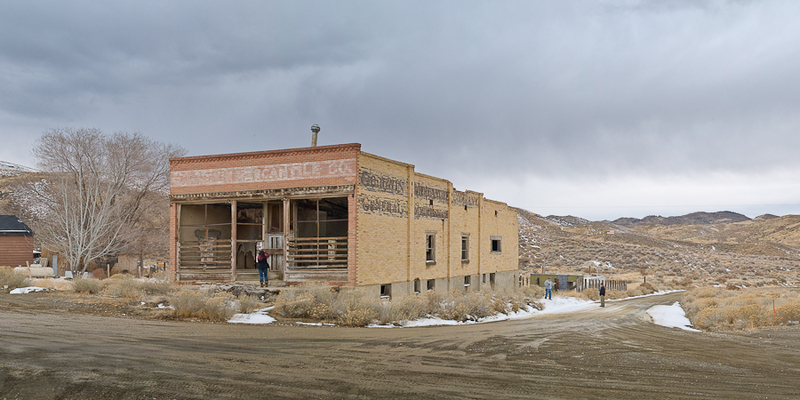 I joined in and shot about 30 frames of the building from a few angles so I could stitch together a panoramic image of the place. Next stop Wendover. A quick dinner and then the trek back to Logan. Since a winter storm was hitting the Wasatch Front I opted to take a northern route back to Cache Valley via the Old Midland Trail (Utah 30) and hopefully avoid traffic and snow. As it turns out it was the best option. In two and a half hours I made it to Tremonton and entered Cache Valley via Riverside. At Beaver Dam the snow had started and the road conditions deteriorated rapidly. Crossing the valley the snow just kept coming and traffic slowed to a crawl. My journey that had started at 7 AM that morning was completed 17 hours later at 11 PM. The only trouble I had was getting up my steep and snow-covered driveway. But I made it. All images photographed with the Leica M8 and Zeiss ZM lenses. I have to say those are real intersting picutures. They came out very well. Good to get an update on you, Andrew! I really like the photographs of the horses and the station above it. Nice post. Beautiful photos! Who knew a desert could provide us with such wonderful images! Great photos. I have hitchhiked through Utah many times. There is some beautiful, rugged country in Utah. I’ve explored Southeastern Utah extensively, but have missed out on the northern areas. Lovely photos! What a fun excuse to get out and see the sights. I look forward to more adventures from you and your camera! Beautiful photos! I lived several years in central Texas and while Utah is not Texas, it is like enough that it stirred a bit of bittersweet homesickness in me for the west. I’m definitely going to follow your blog – great work! The express riders had a lot of respect from folks–for good reason, their work was solitary, exhausting and dangerous in some of the most beautiful surroundings on Earth. Thanks for letting us see that there are still vast places! What a great adventure! Thanks for sharing! Great Photos and story. The West Desert of Utah and Great Basin, High desert region of the West in some incredible country and one of my favorites. I grew up in Utah – Utah County – and went four-wheeling out west of Lehi all the time but never did I get to see wild horses! Pretty! I scrolled all the way back through your blog. I hope you are eventually able to get to the many other, diverse, parks in Utah… personally I think they’re much more exciting than the rolling hills, the clear favorite being Zions. :) Have fun exploring! And you have some gorgeous photos! Dreamy landscape. Sigh, One day I’ll get to see the world. But for now Im stuck in Ontario, Canada. Your photos of the fascinating landscapes here are breathtaking magnificent. I wish I could go there soon again, I traveled in Utah and surrounding states in 1995. Loving your photos – thanks for sharing! Congrats on being FP!!! Fascinating scenery, and very good photostory…. thanks!!! Wow! Really inspiring pictures. Northern Utah is beautiful. Wow, those were amazing pictures. But I am curious – I notice only one of the vehicle had two extra gas tanks of gas, the rest seemed to have only one??? 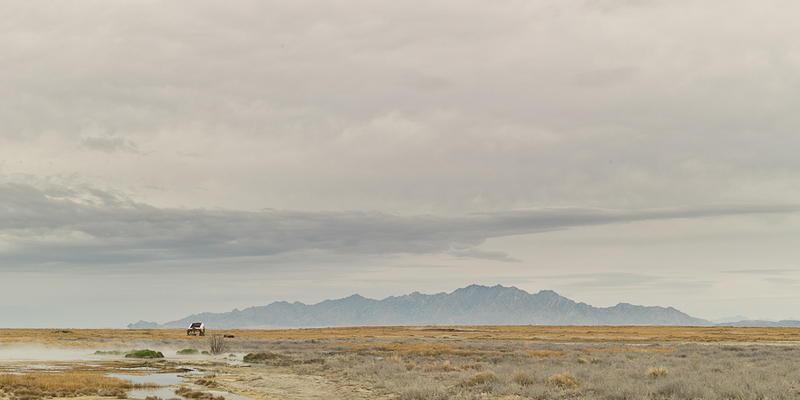 Gorgeous photos of the West Desert! Thanks for sharing I never know it was that beautiful! 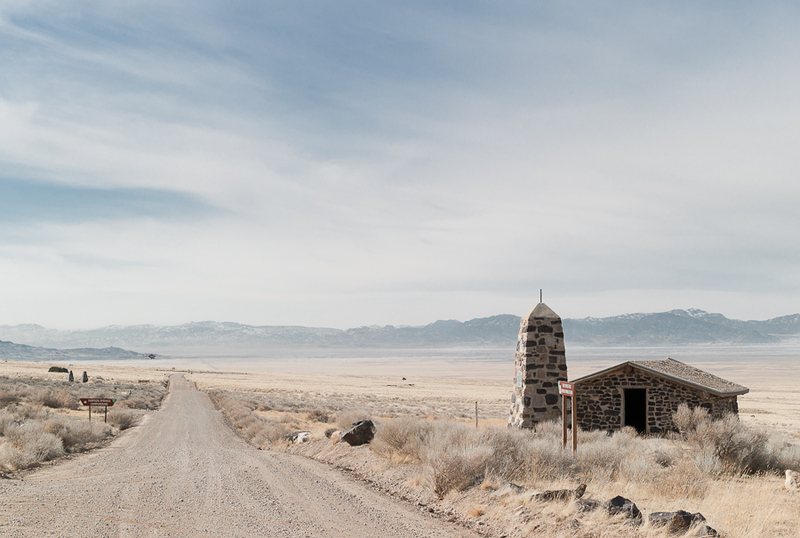 Your photographs amazingly represent the rough, rugged landscapes of the West. I would love to travel and trek through where these photographs were taken. Driving through the West must have been a great adventure with unlimited excitement and very invigorating. Andy- Love the pictures! Beats Akron any day. Looks like you made a good choice. Although I do miss seeing you! I like the photos best that don’t have the vehicles in them. That photo of the old church and the one of the horses caught my eye. The photos would have been much nicer without the cavalcade of cars in them, in other words with more emphasis on the setting instead of the seating. Just sayin’. I appreciate your comment and understand what you are getting at. However the point of this blog entry is about meeting up with a car club and traveling together as a group through the western desert so I feel that including the Xterra’s is necessary. I have to say that it was interesting traveling in a large group as I am usually out exploring by myself. Thanks for looking. Beautiful. But all those Xterras lined up look like a colorful invading army. Scary. The “Pony Express run” caught my eye. My grandmother rode in the Diamond Jubilee 1935 Re-ride. She rode her horse several miles through southeast Nebraska to help in the celebration. Thanks for the story, great photos and bringing back memories of stories of my grandmother. Beautiful Pictures-Love a little Pony Express History too! Live here in Nibley… great post… and great pics! It is all very beautiful though a bit too big…….. the country, not the pictures. What a huge ountry! Don’t they get lost in it? I had a distant relative, great-great uncle maybe, who rode the Pony Express in Nevada. Looks like those spare gas cans on your vehicles is a must in that country. I have travelled much of the United States and have to say that I love Utah ! I get a bit of that “Utah feel” when I drive down to the Dead Sea. I am not much for taking pictures, but maybe next time I drive down there, I will stop for a shot. Off-roading with other enthusiasts is a special experience. Thanks for the good read! Great blog! Wonderful photographs. I live in Eureka, Nevada, along the Pony Express Trail and the Lincoln Highway. We have driven/camped our way across Nevada. Looking at your blog post makes me want to do the same across Utah. Check out my photography website and wordpress blog. Thank you for sharing. The photographs are excellent! Great pictures, nice use of repetition with the vehicles. I’ve read about this road and it’s on my list so thanks for the great preview. 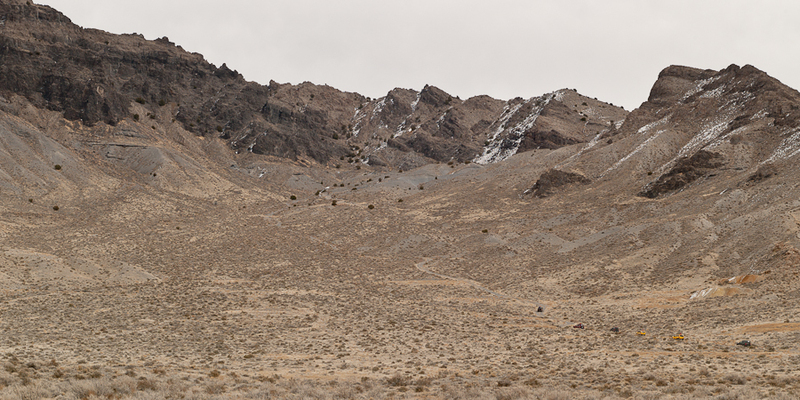 We’re in a Land Rover, mostly northern Nevada. Looking forward to Utah next. Wow, that’s some peace of photojournalism, impressive! Really nice pictures and writing. I’ve done some dirt-road driving in the West (US & Canada), but not in a 4×4, and not this time of year…was in a Datsun 240z…you can get going pretty fast on dirt! Congratulations on being Freshly Pressed. Definitely nice to read about and see photos of the great state of Utah! (SLC local, here) Next you should capture the grandeur of our mountains! Mount Timpanogos, Mount Olympus and the Unitas..I love that in one days worth of travel you can see Red Rock, play in the snow and roll in sand! Glad you made it home safely from your trip! No fun traveling in a storm, even when you have a 4X4! PS- I wonder where the Rovers went that day? 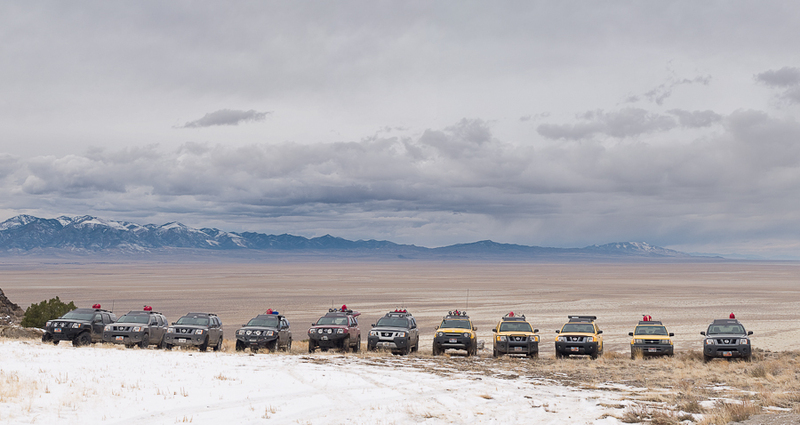 I really enjoyed the line up of vehicles (rather than horses) on the plains…sweet. Great photos! Reminds me of Death Valley in the wintertime. Were there any buffalo around, by any chance? You might also want to consider including a map of your route to give geographic context. Good idea. I’ll look into adding maps. No buffalo this time. I just happened by your blog, what a great time your group must of had. Wonderful photos! I will be watching for your next outing. Impressive pictures. I like the long gravel road with the small station to the right. A bit nostalgic. Love the long valley scenes. Not much like that near Chicago. Thanks for sharing. In my eighth grade English class there was a poster of an old advertisement, recruiting pony express riders. They wanted young and fit and ideally orphan boys, expert riders, at ten cents a trip across the desert. A hundred and twenty years too late – and only slightly unqualified – I wondered where to sign up. Perhaps a Nissan would make the trip more pleasant. The picture of the wild horses is beautiful and simply amazing that you were able to see that. The pony express is a great idea for our next trip – thanks for sharing!! Seeing the horses was great. I’m glad the group made such a long lunch break there otherwise we would have missed it. Lots to see out there. Great photos. I can tell that’s Utah, I’ve lived there, and there’s nothing quite like seeing clouds stretch across desert and mountains. What an absolutely blast ! I love how the collection xTerras really create the story in your photos. Thanks for sharing and congrats on the Fresh Press ! Great pictures! Living in Australia I really love the open vistas. Very similar and makes me want to visit. Lots to see here in Utah. Do come and visit. Australia would be an amazing place to visit too. Be very careful when visiting this area in the summer. Really remote and really hot. I love these photos! They are so expressive of the west. Thanks for the memories! We lived in Cedar Valley up until 1994 and explored all the places you mentioned. My husband was a real history buff on the Lincoln Highway and Pony Express. Remember many fun times wheeling around that country. And you captured it all beautifully!!! Glad to help. Utah has so much to see and share. What an interesting post! I never knew there were clubs for Xterra owners or I would have looked for one when I lived in Wyoming. Some of my favorite days there were spent driving around those dirt and gravel roads with my camera. It is such a great vehicle for out west. This looks like such a fun way to explore and have lots of folks nearby to get you out of any jam you might find yourself in. It is so rare to go exploring out west and not be isolated. 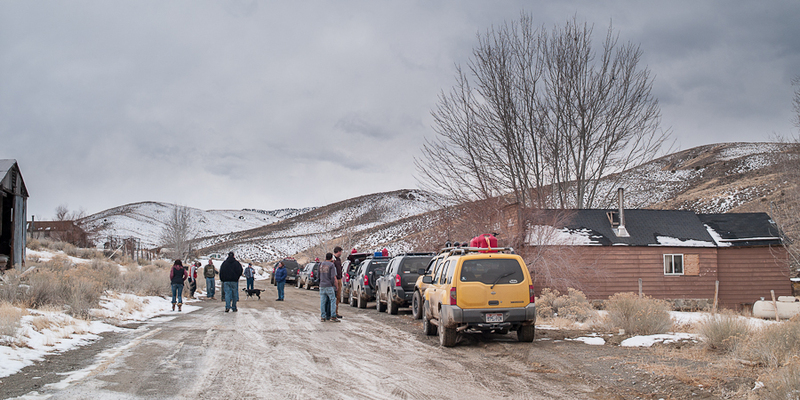 Traveling with a car club was a great way to see a desolate part of Utah. Safety in numbers is right. With the group I went places I would not have known about or attempted if I was alone. I’m looking forward to more drives with them. Thanks for your comment. I like that you describe them as awesome and eerie. 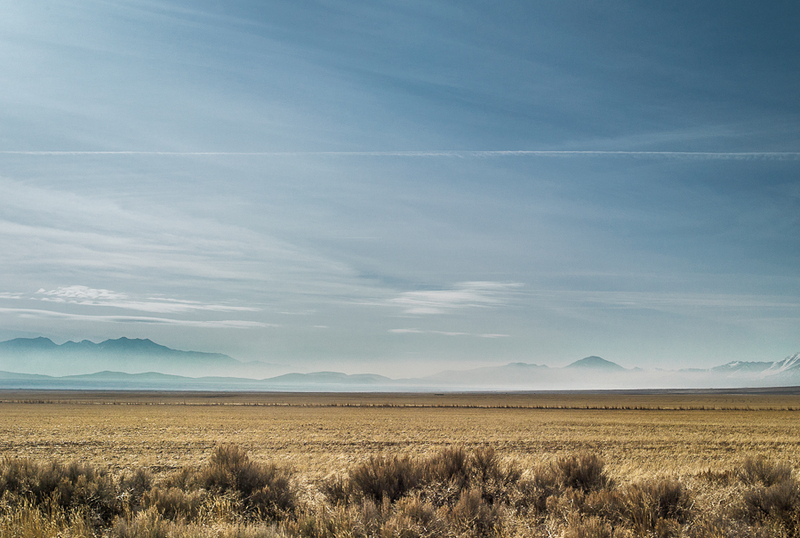 The western landscape is eerie many times and worth photographing. It’s not all pretty sunsets and large rocks in the foreground. thanks for commenting.